Toronto condo renters are facing sticker shock amid a supply crunch as new mortgage rules have been pushing more prospective homebuyers into the condo market. 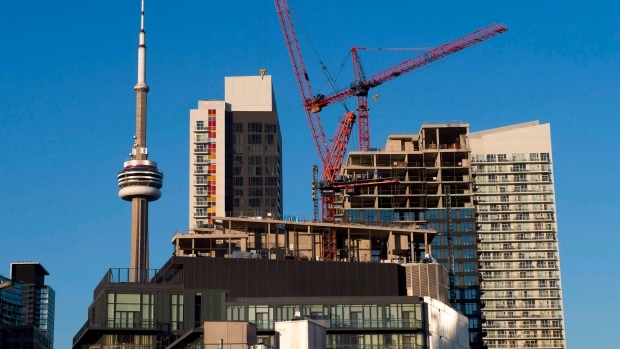 The average monthly rent for a Toronto condo surged 10.7 per cent year-over-year to $2,206 in the first quarter of 2018, according to a report released Wednesday by real estate consulting firm Urbanation. The report said renters have moved more toward cheaper rental options like studio apartments and one-bedroom-without-den units as rents rise. The number of rental units up for grabs in the Greater Toronto Area dropped 12 per cent year-over-year, while listings sat on the market for an average of 18 days compared to 20 days a year earlier. And a total of 5,302 condos were leased in the first quarter, marking the lowest level in three years. “Renters in the GTA are facing very strong market forces that are pushing hard on demand while new supply remains stubbornly low,” Shaun Hildebrand, Urbanation’s senior VP, said in a release. Hildebrand added the conditions should improve “at least somewhat” in the latter part of the year as more condo projects are completed and buyers adjust to the new mortgage lending rules introduced in January.